Waiting for the project to be completed can be very boring, especially when there is nothing you could do to speed up the process. Out of boredom and curiosity, I took the Benz out today and strapped it on the rollers for a dyno run at GT Auto. Well, nothing to shout about on the power it made. It cannot get any sadder to see a 2.4 liter V6 engine to produce such pathetic figures, sigh. It is even lower than my stage 1 turbo kit, this car is definitely going nowhere with such a heavy body. And now you know what wonders can a simple bolt-on turbo kit do to your Toyota Vios, the Benz actually has no chance at all against the Vios turbo. 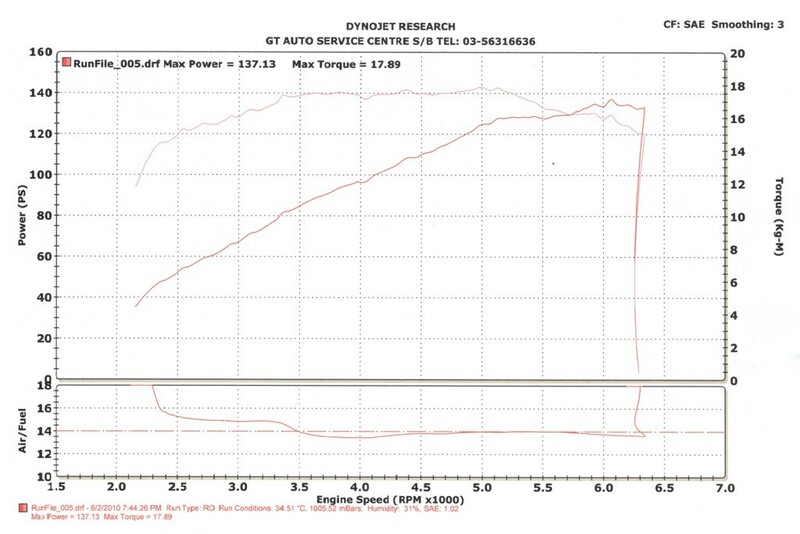 But looking at the flat torque curve did somehow put a comforting smile to my face though. So you must wondering why would an European car appear here? Well that is because GT Auto will be offering ECU flashes for European cars very soon. And this Benz could be one of the project cars. i see you were really bored!!! afr is pretty spot on too...is it a 1.8 supercharged motor? yeah im indeed very very bored, toby just sent the car to ah heng only today for the pipings to be done. 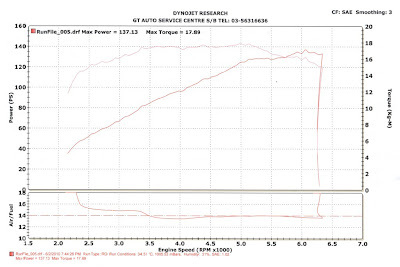 the car is a 2.4 v6 NA, thats why i said the power output its damn pathetic haha! Do you think GT Auto can possibly do a ECU re-flash/tune a Mitsubishi I (HA1W)? Yes they are able to do a flash and tune for the HA1W, its a Colt right? Around RM 1.5K can be done complete if not mistaken. I hope you don't mind checking it out for me. Wouldn't mind investing in a Standalone ECU if they are capable of doing it. Yup its OK the flash works for the Mistubishi i as well. It depends what your mods are man, there are still limitations with the stock ECU with flash as you can't add in any extra inputs/outputs and other stuffs as increasing the size of the maps. personally, i would go with a standalone ECU anytime. good long term investment. would you be free to drop by GT Auto and talk to them directly? im not the owner therefore i cant do much besides sharing information with you. If you do drop by SG, i would be more than happy to bring you out for a cuppa. In the meantime, my car gets its regular fix at Garage R and they have mentioned that it is "impossible" to tune/re-flash the ECU etc. So if you're certain that GT Auto can sprinkle some fairy powder on it, I will be more then happy to drive down and let them have a go at it. OK, just finished talking to Toby. He tuned a couple of HA1Ws before so he's sure its definitely possible to tune the car. Is yours an auto or manual transmission? With turbo I assume? By the way, checked the link you gave me. Seems like the Mitsubishi i is using either 3B20 or 3B20T? By the way, think we can arrange for you to drive the car down. If can please shoot me an email so I have yours, and can take it off from there. Sorry my bad bro haha, GT Auto laughed at me. Thanks! So it shouldn't be a problem right? Any rough price estimation? P/s: Sorry, I couldn't find your email anywhere. Hi CCS, have dropped you an email.